Bute Island Foods came to KK Balers for a solution to help them streamline their waste, with the aim to recycle materials where possible and save time and money on waste disposal. They are the UK’s leading manufacturers and suppliers of Vegan and Dairy Free cheese products. With a state-of-the-art facility, they are able to satisfy the huge demand in the growing Vegan cheese market both in the UK and internationally. After approaching KK it was quickly determined that their needs would include a variety of Waste Management solutions which KK could fulfill for them with their large range of machinery. From baling cardboard to compressing drums it was a project which KK were keen and able to take on for them. It was also a project that needed coordination for delivery of the heavy machinery from the UK mainland across to the Island of Bute via ferry. One of KK’s head engineer’s, Malcolm Gunner was key to completing the mission successfully. There were 3 x KK 500 balers, as well as the KK Drum Press, KK 1100 Ltr Bin Press and KK Bag Press delivered and installed, as well as training provided for members of the Bute Island Food team that would be using the machines. The KK 500 Baler was the most suitable baler in the range for Bute Island, as they deal with a lot of cardboard and plastic waste. The powerful machine out-performs any other vertical baling press of its kind. 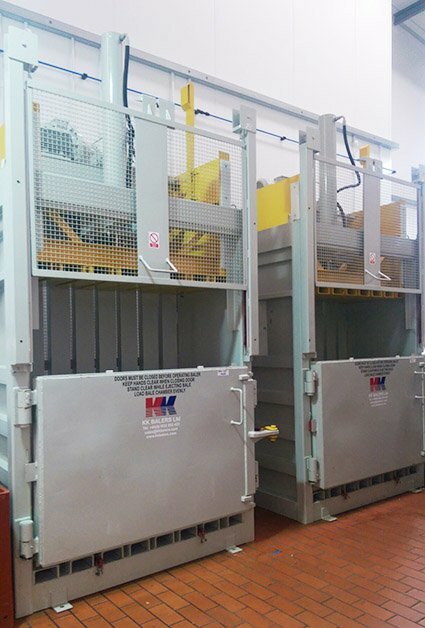 Materials are compressed into dense mill size bales, of up to 600kg in weight. The wide feed aperture simplifies and speeds up handling of bulky material. Bute Island foods will see their storage, transportation and waste disposal costs dramatically reduce. 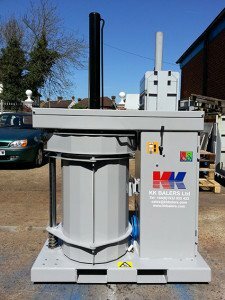 To improve management of storage and disposal of used drums KK installed one of their Drum Press’s, which with 24 tons of power crushes all 205 litre/45 gallon metal drums to a fraction of their original size. This adds even more value to the savings for Bute Island as their storage space and waste clearance costs will reduce even further. KK 1100 Ltr Bin Press works in a similar way where general waste is pushed down to a manageable size, reducing the volume in 1100 litre bins. Another solution for general waste KK supplied a KK Bag Press to Bute Island. Suitable for both wet and dry waste the machine is top loading & has a split chamber for ease of bag removal. Its also wheel mounted for quick and easy movement, high compaction force of 10:1 and it also has a low operating height. With the six machines in place Bute Island Foods waste management is in good order. Cardboard and plastic is being recycled and general waste is being minimised. Jon Lawton, Managing Director, KK Balers comments, “When we were first approached by Jan at Bute Island Foods we had an in-depth discussion in regards to how the company was currently running and what systems they had in place for Waste Management. 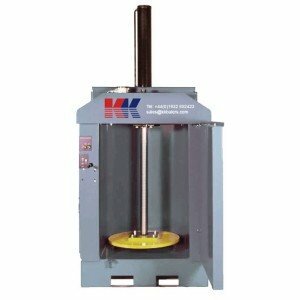 It soon become clear that we could supply the variety of the machines that were needed and it saved them a lot of time and hassle to come to the one company for all their needs”. KK Balers has been established for over 35 years supplying customers in the UK and internationally. 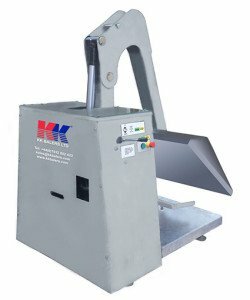 To find out more about how the KK group can help improve your waste management visit www.kkbalers.com.